Your kids are going to love this! This is so fun and all you need is some milk, dish soap, and liquid food coloring. Watch the video to see how it’s done, then grab a bowl, an audience of little eyeballs and your magic hat, and prepare to dazzle the kiddies. 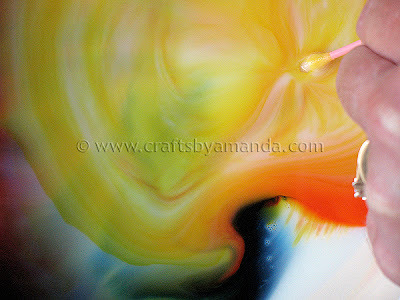 EDITED 3/9/11 – I’ve added another video that shows how to create an awesome star. This is perfect for little kids as they don’t have to drop the dish soap in, they use a cotton swab instead. I’ve also added some more pictures showing the effects on the star as you use the cotton swab in different areas. VIDEO NOTES: pardon the long shot of the plain milk in the bowl while I explain what’s happening. Other than that I think we did ok! No barking dogs, I turned off the TV, and no phones ringing. Woohoo! Below are just a couple more cool still shots of the experiment :) The last one where it’s starting to look army green is when all the colors are finally starting to blend together. The next video shows how to make this awesome star. Below the video are several still shots of after effects. Enjoy! I did this with my 2 great grandsons and they absolutely loved it. They want to do it all the time now but can’t understand why we can’t save it. We ran out of the liquid food coloring, and like someone else posted, I can not find it. I usually shop at Krogers or Wal-Mart and both of them only had the gel ! I will keep looking tho. That’s odd! They have all kinds of it in the stores around here. Are you looking by the extracts and spices? Thanks for the great site. I need some help with reproducing the star. No matter what variation I try, I only get results like the first set of images. Nothing even closely resembling the star. I’ve tried cold/warm milk, more/less milk, more/less soap, more/less food coloring. Can you suggest any more details to try to produce the star? Is the heavy cream vs milk the key? Thanks! Try adding HAND SANITIZER!!! Woah, that is funky! We tried it w/ the milk first and then experimented further with the hand sanitizer. It was cool to see the different reactions! Oh how fun, thanks for that top Sabina, we’ll definitely try it! You are so talented!! I have been browsing through you site and you are truely gifted!! I love all the ideas and crafts!! I will definately be subscribing to you!!! ps I love this milk and food dye idea! cant wait to share it with my kids!!! Jackie – I'm surprised you couldn't find liquid food coloring, it should be by the spices, herbs and extracts. :) Of course, assuming you are in the U.S.! That is actually really cool! I've never seen that one before. Going to do it with my kids tomorrow! That is a really cool trick. I can't wait to show my kids. Thanks!!! love love love all your fun stuff! thank you for posting all these ideas and crafts! !